I called in to Churchgate recently for a catch-up, and in conversation, sausage man Dan mentioned about a new flavour that they had developed. I will admit to being a bit ignorant about white pudding. I had assumed it was a version of black pudding that to be honest, I'm not too struck on. Dan explained that the new flavour combination had come about through experimentation along the lines of the pork & black pudding sausage that Churchgate have produced for a while. White pudding is essentially pork, pork fat, suet, oats and seasoning that's sometimes referred to as oatmeal pudding. Popular in Ireland, Scotland, Northumberland and further afield. 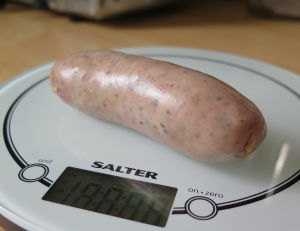 White pudding yes is similar to black pudding, but importantly does not include blood. Now the rule is, where possible, we pay for sausages for our reviews, but Dan was so keen we tried these, we were given a couple along with the bacon we did pay pay for. 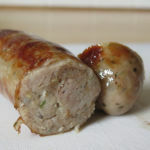 Jason Drage and sausage man Dan at the Churchgate Sausage Company make some seriously top quality sausages and these we are informed follow the recipe for the excellent Churchgate Lincolnshire that we reviewed recently. In fact in the display, the Pork & White Pudding were in the next tray to the Lincolnshire and I had remarked how very similar they looked in the raw. 80% Essex pork shoulder, with sage and ground white pepper. Rusk rather than breadcrumbs and most importantly the 10% white pudding (approx). 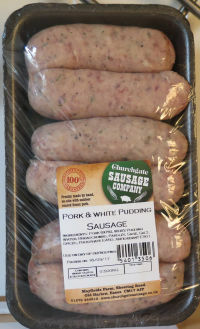 The white pudding at present comes in the "rounds" or "rings" from a well established producer in Kent called Slomers, who's famous white pudding has been recognised as the ‘Best in Britain’ by Country Life Magazine. Cooked up the samples performed just like the Lincolnshires to be honest, keeping their plumpness and showing very little shrinkage and weight loss. 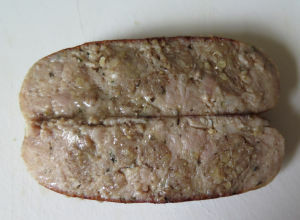 See the photo below of the sliced sausage for the "lumps" of pretty well evenly distributed white pudding. A masterpiece of sausage art as far as we are concerned. The taste was so delightful and moreish, we ate the two samples and immediately craved another......."Please Sir can I have some MORE" ! It would be fair to admit that I called back to the shop and bought a dozen just the following day they were so good. The texture is so enhanced with the white pudding it transcends from "it's just a sausage" as one of the troops always seems to utter, to something of pure delight to eat. Eaten cold later, well, they are so so good! You really do need to buy some yourself to try, sooner rather than later...please tell Jason and Dan you heard it from us! 105x32mm before cooking, 100x32mm after. 85g before cooking, 81g after. That's a shrinkage of 4% & weight loss of approx 4%.